Hello yet again. I have accomplished a lot today which has helped my anxiety from Monday about not getting everything on my to do list done IMMEDIATELY. I have been lazy about changing my name on my license, so I did that this morning before work. I tend to over prepare for things like this and showed up right whey opened with a folder containing every possible piece of paperwork I could ever need. My new “no-teeth smile allowed” license should be here in a week. I was done in 45 minutes and didn’t have to be at work for another two and half hours so I popped around town and spent money that I probably didn’t need to spend at the health food store and Party City getting decorative bags for when I give out more nuts and bolts (half literal). I wandered around the health food store staring at things as I am known to do until someone inevitably asked if I needed help. I’m such a creeper. I wanted to ramble on today for Amanda’s Thinking Out Loud linkup. If you’re not familiar, click on the link and check it out. I like being able to randomly talk about whatever. I’m scatterbrained today. I can’t tell you how many times I have made myself feel bad because I compare myself to someone else. I have a hard time being happy with myself in the moment sometimes. In the previous example, I felt justified in not trying to have kids immediately because she also was just taking the time to enjoy married life. Once she announced she was pregnant, however, the comparison was shattered and I was left questioning my decision. At the end of the day we want kids, but not right now. And that’s ok.
My body image issues were always because of comparisons. Once I was able to accept myself the way that I am, the judgement of others and of myself slowly slipped away. The only way that I can feel bad about myself or my choices is by placing negative or positive value on them compared to something else. 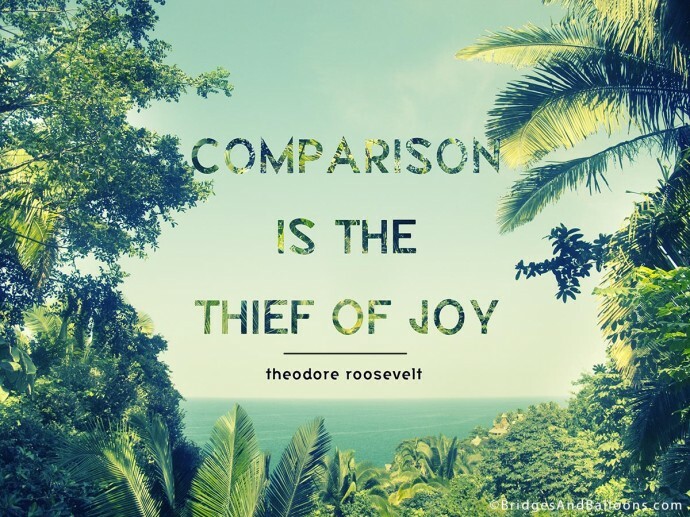 I can use comparisons to make myself feel worse than or better than and both seem detrimental to me. Feeling worse than is obviously somewhere that I don’t want to be, but feeling better than can be more insidious. Ultimately it involves me putting someone else down to lift myself up and I don’t find that to be a very attractive quality. Even though it may only be a passing thought in my head, it’s not the kind of person I want to be. What I strive for is being content with myself no matter what. It is very easy for me to default to comparisons in all areas of my life because it’s how I lived for so long. Eating habits, exercise, temperament, etc. I can compare myself in any arena of life. That girl runs faster than me. She is better at life. She is a nicer person than me. She is better at life. She can lift more weights than I can. She is better at life. Her blog is better. She is better at life. Why can’t everyone eat healthier? I am better at life. I have to remind myself that I have no idea where someone has been in life or what they may be going through. Everyone is unique and everyone has a story. No one is better than or less than, they’re just different. I try and let people be who they are. I have no control over them or their decisions or their actions. The more time I spend concentrating on being the best person that I can be, the less time I have to judge others. I find that when I am actively accepting and encouraging myself, I can accept and encourage others as well. Question of the day: Do you get caught in the comparison trap? What do you do? If someone were to say they’d never fallen into the comparison trap, Id call them a liar. It happens, we’re human! There is going to be those moments in life where you compare something about you to another person… however, it’s up to you to decide whether or not you should allow it to affect your life. It’s up to us to see our true beauty, to see our skills & accomplishments. To basically believe that we are fantastic, fabulous & wonderful. I’m terrible about this! I fall into this trap SO easily and SO frequently, because I’m such an insecure person by nature. I tend to go through bouts of it with blogging too – I’ll find myself comparing myself to other bloggers and how their eating or working out, or even just what kinds of opportunities their getting! It’s a horrible habit, and I’m trying to become more aware of when I’m doing it. Great post, and you’re certainly not alone! I hear you!! I’ve definitely been guilty of this. I had to pull back from blog reading for a little bit a few years ago because I was overwhelmed constantly comparing myself. I’ve learned to relax and realize that we’re all created for different reasons, but it can still be hard NOT to compare myself!